Recently, while having dinner with friends, this book appeared and stopped me cold. As interesting as my dinner companions were (and they were interesting) I immediately wanted to find a quiet corner and lose myself in the pages. 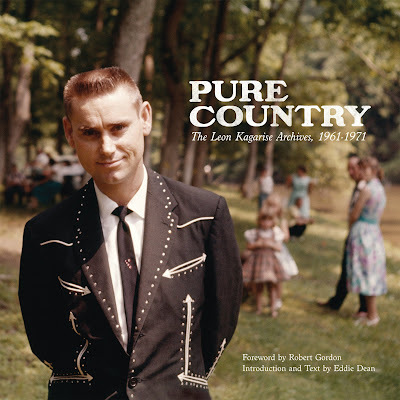 Throughout the ‘50s and ‘60s, many of country music’s biggest stars first won over their audiences on the small backwoods stages of rural America’s outdoor music parks. 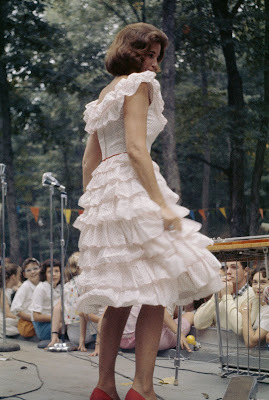 These intimate, $1-a-carload picnic concerts might have been forgotten if it hadn’t been for the documenting eye of music lover Leon Kagarise, whose candid photographs of the musicians and their fans provide the only surviving window into this long-vanished world. Largely natural light, mostly outdoors, Leon's photos capture a formal showmanship that may be extinct. I don't long for the naive good old days as I don't believe they existed. However, I do think there is a sincerity of performance that could not happen at a picnic today. A bolo tie and ruffly skirt review would be impossible without an implied wink. I can't imagine what a similarly formal, modern performance would look like, but when I look at Leon's photos I do wonder about it a lot. June Carter was so beautiful. And, she wore a ruffly skirt and growled. Jackson. I always thought June, Johnny and Rick Rubin could have done wonders with X's Burning House of Love. Too late for that now, but maybe John Doe and Exene could cover Jackson.